Legends of Southern Hip Hop – Usually when a tour starts throwing around the word “legendary” to describe its bill, you can expect that they’re using a pretty liberal definition of “legend.” More often than not, it’s an anti-climactic parade of one-hit wonders putting in just enough effort to pull a paycheck. Not this time, son! 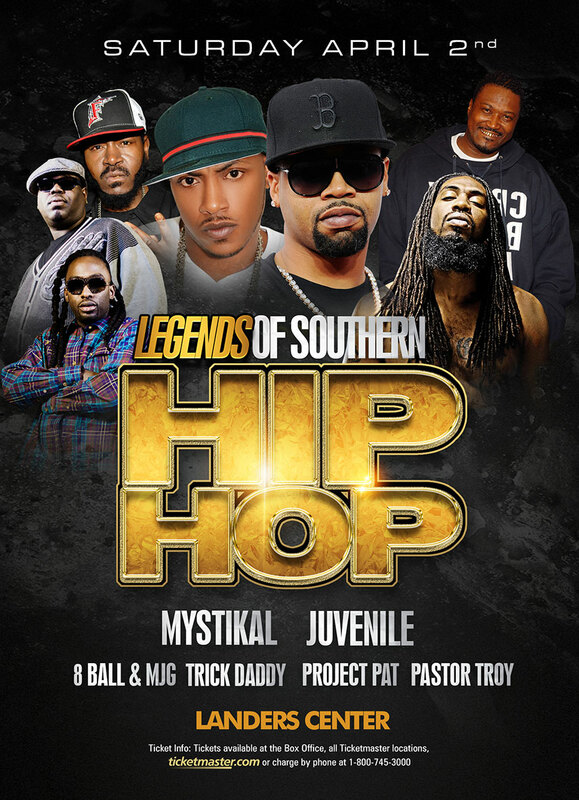 Landers Center will host “The Legends of Southern Hip-Hop” on April 2nd, featuring a stacked lineup of legitimate hip-hop royalty: Juvenile, Mystikal, 8Ball & MJG, Trick Daddy, Pastor Troy and Memphis’ own Project Pat. Tickets go on sale this Friday, Feb. 5, through Ticketmaster and are priced between $45 and $75.